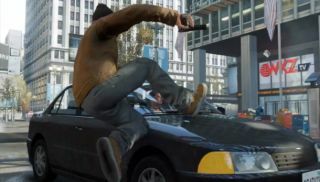 When Ubisoft revealed Watch Dogs last year, there was some initial uncertainty about how the game's structure and mechanics would mesh. Would it be an urban Deus-Ex-meets-Hitman hacking and problem-solving game? Would it be a sandboxy third-person shooter that visualizes data in the world, and gives you a tool (your phone) to manipulate it? Based on Ubisoft's new video for Watch Dogs released today, it's looking a lot more like Grand Theft Auto than we initially expected. The Rockstar-style camera work, editing, and music all feel like they could be hyping a slightly more serious, conspiratorial GTA game. Pearce is shown chasing down another character, over which he narrates in his best Batman Voice, "In this city, no one can hide from me. No one." This tells me to expect GTA-style pursuit missions to be a primary piece of Watch Dogs, with information-gathering through the game's hacking techniques possibly acting as a prelude to that. Watch Dogs is out in November.